Back to the future is the motto of this fabulous eleventh Star Trek instalment: with state-of-the-art FX back to the beginning of the story so far untold. The freshly graduated crew around James T. Kirk (Chris Pine) and Spock (Zachary Quinto) starts out on the maiden voyage of the U.S.S. Enterprise. In 2233 James Tiberius Kirk (Chris Pine) is born on the very day that his father George Kirk (Chris Hemsworth) becomes captain of the U.S.S. Kelvin for twelve minutes, before he dies in her destruction by the attacking Romulan ore transporter Narada. James and his mother are able to escape and the boy grows up on Earth. There he leads a rebellious and naughty life until Captain Christopher Pike (Bruce Greenwood) provokes him to join Starfleet Academy. During his studies James flirts with Nyota Uhura (Zoë Saldaña), who is attractive and intelligent and sends him packing each time, and he becomes friends with gruff Dr. Leonard McCoy (Karl Urban), who fled from Earth because of a failed relationship. James's third attempt at the attack simulation as part of his final examination runs conspicuously and therefore he is charged with fraud. The accuser is none other than Spock (Zachary Quinto), who has programmed the simulation. Spock grew up with his human mother Amanda Grayson (Winona Ryder) on Vulcan, but as a half-blood he has difficulties controlling his feelings as is the habit of Vulcans, who are logically inclined. This is why Spock has been the victim of animosity in his childhood. Despite this he has been accepted to the Vulcan Academy of Science, although he declined it for Starfleet Academy. During James's hearing Starfleet is being called to the protection of Vulcan. Uhura and McCoy get assigned to the U.S.S. Enterprise. McCoy smuggles James, who has been suspended, on board with a trick. But already at the beginning of Enterprise's maiden voyage James impulsively interferes in Captain Pike's affairs, because he anticipates a Romulan trap. Over this he falls foul of reasonable Spock. „Star Trek“ is a stem cell treatment for the 43 year, 726 episode und 10 feature film old Star Trek universe. After the poor success of the last films and the last series this is indispensable. 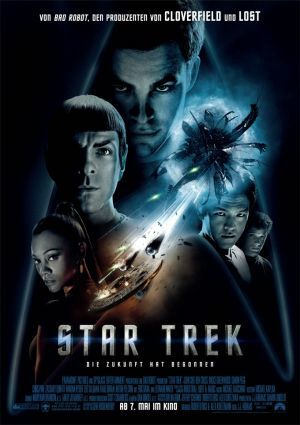 With fresh faces, modernized sets, state-of-the-art effects and lush action, innovative director J.J. Abrams („Alias“, „Lost“ and „Mission: Impossible III“) begins a new and worthy Star Trek chapter. And where does one begin a reboot? At the beginning, of course! This principle we already know, in a fashion, since „Batman Begins“ or „Superman Returns“, both of which tried to reanimate an old series more and less successfully. „X-Men Origins: Wolverine“ takes the same line at the moment. The new Star Trek adventure has been drafted by screenwriter duo Alex Kurtzman and Roberto Orci, who already revitalized and hyped up the animated toy series „Transformers“ for the big screen. Probably also hoping that the young cast credibly grows into further voyages after a successful revivification (the next instalment is planned for 2011), the future of Star Trek starts at the never told beginning: Captain Kirk and Spock's childhood, their first encounter and the maiden voyage of the legendary U.S.S. Enterprise. It goes without saying that this is not merely self purpose, but also a true enrichment for the Star Trek cosmos. To please die-hard fans on the one hand and to get enthusiastic a new generation, which is used to more spectacle, Abrams and the screenwriters set great value upon the balance of authenticity and overhaul. Argus-eyed they cast rather unknown actors, which had to resemble the original cast (William Shatner, Leonard Nimoy, etc. ), but also had to have enough charisma of their own. The resemblance is stunning and the performance excellent. Especially Spock actor Zachary Quinto captivates everyone in the audience. The cast is but one of the highlights of „Star Trek“. The forceful action scenes with pop appeal as well as the delicately humorous undertone are more reminiscent of „Star Wars“ then of the rather tech-oriented Star Trek predecessors (ice planet Delta Vega reminds so much of Hoth). But in spite of all the fight scenes the film is also a subtle character study, which focuses on the growing together of different characters and on the compromises in the conflict of rationality and emotionality – albeit not with the depth of a classical drama. Despite its excellence the film exposes a few blemishes: unnecessarily unsteady cinematography in a few sequences catches the eye negatively and not everyone will find the pompous soundtrack appropriate; the CG creatures on Delta Vega don't look convincing and the green make-up of Kirk's lover from Orion is very blatant. But except for these minor flaws „Star Trek“ is probably not only the best instalment of this series, but beyond that simply a great movie.